The civil justice system is an avenue for victims of crimes to receive justice separate and apart from the criminal system. While criminal cases involve a defendant who broke the law, civil cases are most commonly legal disputes between two or more people. Victims of crime can turn to the civil justice system to receive justice, even when there has already been a criminal trial. Rather than facing jail time, defendants may have to pay monetary damages or forfeit property as restitution for the victim’s pain and suffering. Even after a criminal case is over, many crime victims feel they have not been properly compensated for medical bills, time away from work, or even emotional distress. Unlike in criminal cases, the civil justice system can protect the privacy of the crime victim. Personal information can be redacted from court documents, records may be sealed, and confidentiality agreements can be included in settlements. Additionally, wrongdoing in a civil justice case does not need to be proved beyond a reasonable doubt. Instead, the victim and his or her counsel must convince the jury or judge by “preponderance of the evidence,” or provide evidence that is more persuasive than that of the opponent(s). Attorney: An experienced crime victim attorney will guide the victim through the civil justice system. He or she will investigate the crime and identify liable parties, as well as represent the victim in court. Hiring an attorney is not mandatory, but an experienced lawyer will limit difficulties in the court process. Judge: Even in the civil justice system, judges are imperative in the resolution of a lawsuit. They listen to depositions, reports, and in non-jury cases, are the sole decision-makers when it comes to the verdict and damages. 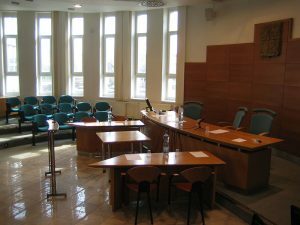 Judges often hold settlement conferences in an attempt to resolve the case before trial. Third-Party Defendants: In many civil cases, third-party defendants are involved. These are individuals or entities who did not personally commit the crime but may be liable due to some contribution or negligence. This group often includes restaurants, bars, landlords, schools, religious institutions, employers, and property owners. Experts: Often, experts will be called into civil suits to report on the damages and liability. If a property owner failed to provide working window locks, an expert in security may report that he or she was negligent and is then liable for the injury a tenant suffered after a break-in. Both sides are able to call in experts, and they are often necessary to provide sufficient evidence in the case. How are Civil Cases Resolved? Once depositions are finished, all parties prepare cases to go to trial or to reach a settlement. Most civil cases end in agreement or settlement, but if the parties can’t agree, the case may go to trial. However, disagreeing parties have the options of mediation and arbitration to attempt to reach a settlement. If the civil case does reach trial, it follows much of the same format as a criminal case. Civil cases can enter into either a jury or non-jury trial. Both sides have the option to appeal the verdict, and settlements are often reached if an appeal has been granted. The following list details some of the major steps in the Pennsylvania civil justice system. Note that the system varies by county and not every case fits this process. Investigation: The specifics of the injury/abuse need to be determined, as well as the responsible parties. In civil cases, the criminal defendant may not be the only one to bear liability. Depending on the specifics of the case, a school, religious institution, bar, restaurant, or property owner could also be liable. Complaint: The victim then files a complaint against the criminal defendant as well as any other responsible parties with the Court of Common Pleas. The complaint is a formal document describing the injury and how the defendant and other liable parties contributed to the victim’s injury. In circumstances where the attorney does not have enough information to file a lawsuit, he or she can file a writ of summons, allowing them to subpoena documents and other information needed to gain that information and file a complaint. Types of Civil Lawsuits: Victims can file claims to bring about civil action. Possible claims may include assault, battery, intentional or negligent causation of emotional harm, negligence, and wrongful death. Discovery Phase: Once all parties are notified of the complaint, the case enters the discovery phase where all parties disclose to one another information about the case. The information exchange comes through the answering of interrogatories, which ask questions about facts, potential witnesses, and other documents. Depositions: This phase is when involved parties and witnesses testify under oath about the case. However, depositions take place in the attorney’s office rather than a courtroom. Typically, only the involved parties, the attorney, and a court reporter are present. Many cases’ outcomes are determined by the depositions. Reports: In most civil cases, experts will write reports about the specific damages or liability. For example, doctors and psychologists may report on physical and emotional damage suffered by the victim. Additionally, various experts may report on negligence that makes a party liable for the injury. Both the plaintiff and defendant can rely on expert reports to make their case. Pretrial Motions: After depositions and reports are complete, both sides may file pretrial motions. Most commonly, the defense attorney will file a motion for a summary judgment, which asks the court to throw away or dismiss the case due to a lack of facts or rule of law that supports the defendant. An experienced lawyer is necessary to defend against these motions. Settlement: Because the cost of going to trial is so high, the majority of civil cases end in a settlement. In Pennsylvania, the court typically requires a settlement conference before setting a trial date. Learn more about the types of victims in the civil justice system.